Glorianna Davenport is a filmmaker and technology innovator who has spent three decades at MIT, exploring the fundamental issues of digital media experiences, collaborative co-construction, and the role of the machine for documentary and entertainment forms. In 1977, she joined the MIT Film/Video Section. 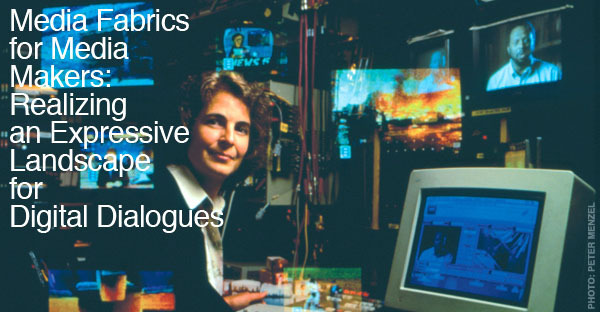 In 1985, she co-founded the MIT Media Lab as director of the Interactive Cinema research group. In her research and practice, she has helped develop the tools, technologies, and methods of modern, non-linear editing and presentation systems. Her larger vision focuses on the creation of more complex, personalizable documentary movies and machine-based storyteller systems that dynamically serve and adapt to audiences widely dispersed across time, space, and culture. Over the years, she and her students developed many important technological innovations, playful constructionist environments, novel delivery systems, and new story forms. In 2000, Davenport was a co-founder of Media Lab Europe in Dublin, Ireland. She ran the Story Networks research group there from 2000 to 2004. In 2003 she renamed her MIT team the Media Fabrics group and greatly expanded her focus on intelligent systems and Web-based social networks. Davenport's teaching has always included a strong production component; she believes that hands-on filmmaking experience gives her students deep knowledge of the underlying problems, parameters, and workflows of media-delivery systems. Group production works include: a series of videodisk-based magazines, most notably Elastic Charles (1988) and Elastic Boston (1995); and an early Web-based multimedia biography, Jerome B. Wiesner: A Random Walk Through the 20th Century (1994). Her own major film works include New Orleans in Transition: 1983-1986, an in-depth interactive video case study of urban change; and Remembering Niels Bohr: 1885-1962 (1985), a posthumous biography of the great physicist. Her work also includes the building of "mini theme park" environments, such as Radio Interference, a collaboration with Antenna Theater (1987); Wheel of Life (1993); and Flights of Fantasy, which was installed at the DeCordova Museum (2001). Trained as a sculptor and documentary filmmaker, Davenport holds a BA from Mt. Holyoke College, and an MA from Hunter College.